White sand beaches, great surfing, abundant nature and a cozy beach community. 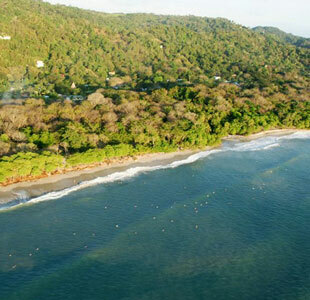 Santa Teresa is a gorgeous beach located in the southern part of the Nicoya Peninsula. It is located North of Mal Pais beach, Playa Carmen and South of Playa Hermosa. This beautiful beach community was first popular among surfers. Back in 97, there were just a few people that knew the beach, and one could surf alone in one of the many beach breaks. Today, it is an alive coastal surf town. Also, the area has become famous not only for surfing but also for the beauty of its beaches, forests, creeks and rivers and the many activities one can enjoy while staying at one of the local hotels. Santa Teresa is probably among the 10 most beautiful beaches in Costa Rica. Also, the area has become a celebrity hot spot, and people like Giselle Bundchen and Leo Di Caprio have been in the area several times. Additional highlights include the Cabo Blanco Nature Reserve and the endless coves, hidden bays and secluded beaches both North and South. Incredible surfing at just 100 meters from the hotel, lots of nature and adventure trips, like atv tours, horseback, waterfall trips, tours to National Parks, or simply walking along the 4 miles of beaches and coastal road. Lots of guarded parking space. Santa Teresa is an area where lots of clients arrive in 4X4 . The small 8 bungalow boutique hotel is well known for its great client reviews. The hotel offers spacious and luxurious bungalows, a beautiful garden and pool and a privileged location at only 100 meters from the ocean. Boutique beach hotel Manala is a small, cozy intimate boutique beach hotel located at just 100 meters from the beautiful North End of Santa Teresa Beach. Book your stay at Manala Book your stay at our beautiful hotel. Inquire about prices, availability and seasonal special deals. Hotel reviews See what REAL CLIENTS have said after their stay at our hotel. We are always ranked in the top 10 position for Hotels in Santa Teresa because of our facilities, location and the truly personalized service we give every one of our clients.